Most people are aware that their credit score is important when purchasing a home, but there is often quite a bit of confusion about what factors determine a score, and how you can improve your credit score. Below is some useful information to help answer your credit score questions. · Do you pay your credit on time? · Quantity of credit Accounts - too many credit cards with balances can lower a score. · The longer the history, the better. · How long have your credit accounts been established? · How long has it been since you used certain accounts? · Research shows that opening several credit accounts in a short period of time does represent greater risk - especially for people who do not have a long established credit history. · Pay all your bills on time or early. Even a 30 day late payment on a small credit card can have a significant negative impact on your scores. · Don't co-sign loans - their late payments are yours! · Don't close old revolving accounts no longer in use. · Report fraud immediately. If you find yourself the victim of fraud, immediately contact the credit bureaus, your credit card companies, banks and the FTC at www.ftc.gov. · Monitor your credit. 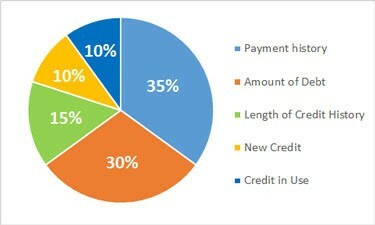 Order a copy of your credit report once a year from www.annualcreditreport.com. · If you are planning to refinance or buy a home, do not make any purchases or run up the balances on your credit cards prior to the transaction.